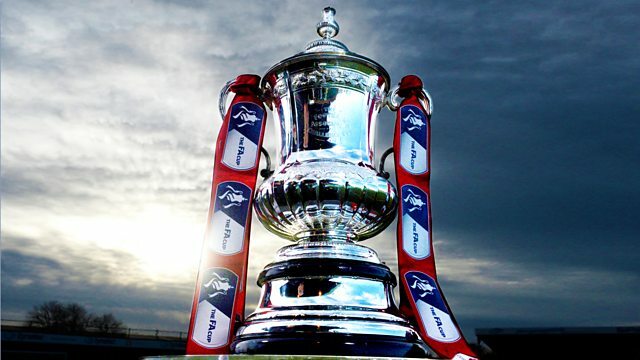 Live coverage of the FA Cup fourth-round replay between Swansea City and Notts County. Browse content similar to Fourth-Round Replay: Swansea City v Notts County. Check below for episodes and series from the same categories and more! the Liberty Stadium these days. Swansea than we saw a few weeks ago. playing some really good football. be pleased to see the recovery? well! What can we expect from them? on the bench as well. Let's here from the managers. told the lads to express themselves. and looking forward to the game. involved in as a manager. He has done very well. He has got them organised. have got this evening is VA. -- Var. needed in the game, definitely. right wing. Roberts is on the left. Liverpool, is back from suspension. Stead. Shola Ameobi is rested. There is the Notts County manager. in a row and were third from bottom. Swarbrick, the Var back in London. have beaten Liverpool and Arsenal. to the left of your screen. right-hand side as right wingback. been a very good start. will want to keep it nice and tight. play-off final. -- Rotherham United. form at the moment for Swansea City. want that tag next to you. that his opponent, skips past him. couple of good early saves. back four for Swansea at the moment. team are going to be swamped. trying to pull away from his marker. is injury prone for a Notts County. better quality there from Narsingh. since he has taken over the job. to the Premier League? Row --? how they will cope tonight. out for the Notts County number ten. opponents but it is the final pass. rat race I can remember. That will test the nerves. invested a lot of money in this tie. A three-day trip to south Wales. well. That was too far for Roberts. It was. It is a cold night. lost his boot. One of them anyway. Nathan Dyer... A good setup. difficult. 15 goals in 19 games. the full-backs from getting forward. the ball nicely under pressure. who is going to go down. and Arsenal beat in here. see more swagger in the players. played Arsenal, seven years ago now. five only five times since 1964.
formation, Notts County. -- Swansea. Nathan Dyer. Here is Narsingh. of offices and training facilities. That was too high for Roberts. and trying to bring him into play. night where we can over in the USA. Virtue. Notts County defending deep. the Premier League side Sara Head. into Abraham. He makes a great run. back. He steadied himself nicely. is pumped and full of confidence. will stop the last was in 2010.
the ball he can't play. are in the driving seat. pace and direction does the rest. Hillsborough in the next round? A perfect start for Swansea. record, they are unbeaten in seven. He is a tough man. disastrously wrong at the moment. would have helped to ease that. League, four starts since October. has had three of them. there. Help the boys, talk to them. kicks from there, do you, Jonathan? his leg back in, what was it, 2006.
back in the Premier League? in there as well, with Aston Villa. Abraham and Dyer, the goal-scorers. And that is a third! 1ft in the next round. into the corner, 'keeper no chance. First goals of the season for him. he? Didn't he snapped his Achilles? 100 metres in 11.3 seconds. No! Fair play to you! running at him for phone. referee, can you see that, Jonathan? It was van der Hoorn pushed him off. avoid clear and obvious errors. surrounded the introduction of it. here, show us what's happening. years is progress for Notts County. Shola Ameobi is warming up. of contention here, has Husin! it's a stunning reaction, isn't it? wonderful finish off his left foot! the phone in the air. it from behind the goal. Noor Husin, his second for the club. it would slow things down too much. issue, but it is a trial. Virtue. And Dyer looks perplexed. Big cross, away by van der Hoorn. Five minutes left in the first half. the foul for his team. bit of confidence to go for it. are in their thirties. Clucas! central defenders, look at that. level. -- he's been a regular. Into the midriff of Adam Collin. Just cut out by Duffy! pocket, difficult to pick up. sting out of County a little bit. zone for ten minutes or so. direction after some troubled years. years. And that's a very good goal! Abraham to rattle that want in. lull, are firmly in control. has set them back again. division does it surprise you? they would be in their faces? challenge, it is quite simple goal. and it's hard to defend. his goals in the end! sitting in there. -- the lad Husin. a little bit of anger, if you like? with some dead ball situations. up against players like this? and rotation has been excellent. will be saying, more of the same. important they were to the club. famous trophy on that day. relaxed in terms of the build-up. fairy tales. You come of the bench. the first person from Barbados. Loads of little landmarks for me. More FA Cup football tomorrow night. made it 4-1. We can be very pleased. around the club at the moment? has given us a fighting chance. team meetings, he is full of energy. I don't know how he keeps going. Vijay Singh player is Calvin Andrew. Jason Shackell has got to the ball. goals in this for Swansea. Martin Keown and Jonathan Pearce. Cup with FC Seoul in South Korea. sense to take Clucas of and rotate. They play Burnley at the weekend. six pointer is. -- six pointers. it is an awesome and them situation. season. -- earlier in the season. the territory. They are coping well. that is the message at half-time. Get closer to these Swansea players. with Jon Stead for the foul. there as quick as he could. sensible referee. One of our best. That would have been a lovely ball. clever. A drag back, a lift. really well in that competition. important he is getting games. until the first game at Nottingham. Nolan's side. -- and their bio. goal in this season's run. in the competition in his career. wrong side. Away for a corner. to run. Knox it inside, get it back. have a fifth. A big deflection. think so. It was just unconvincing. player. County sit very deep. and then he picked up and injury. The referee gives a free kick. has to get to that. it was not a handball. It is must like a testimonial now. don't think it was a handball. County hit by six of the best. County, get one back if you can. experience to some other players. Jonathan Forte. Big Jonathan Forte. He has been around the houses. for a Man of the Match. squad. He makes his FA Cup debut. long rather than a training session. up so well in support. thing. Pick out the front man. was his swansong as a United player. Cup over the years, Alan Smith. in on the act tonight. lovely goal! The best of the night. confidence any harm at all. and he whips it into the corner. beautiful goal. 7-1 to Swansea. Almost too good to believe. Meadow Lane in that second half. Forte. Good pace from him. three at the other end. a share of it, of course. easy tonight, Swansea, haven't they? They've played the simple game well. for the manager as well, isn't he? The system that he plays. WILL go back to the three. come looking for another one. One for you, six for me! half-time, that, Jonathan, isn't it? You sharing out those biscuits! it, to touch, kick the ball moving. see the quality of Swansea here. I think Grant is better than this. Yes, 17 goals this season. it and think, how good are they? Maric waits to come on. spell, not everyone's cup of tea. It is like an exhibition game. them - and that's the difference. don't know who's doing those stats. your way, the Winter Olympics. you're a luge man, aren't you? what it means to him. Nice build-up. away and creates space for himself. the reward for playing youngsters. Bartley, who's defended really well. difference? Headed away by Abraham. it made not one jot of difference! area, they call it now. and they haven't been showboating. role just in front of the defence. Totally in command here, Swansea. Abraham looking for a hat-trick...! space again, should do better. Free kick, Abraham was filed. isn't it? Took a wild swing. today. -- that's a sloppy ball back. back to the East Midlands. - two minutes of stoppage time. foul. That is a hefty one. it is Virtue, just over zealous. him. On loan from them. times it's been far, far too easy. but it was a different class. feel to have been involved? us to do and we managed to do that. Wednesday next, are you up for it? did tonight, then it is difficult? gone now. Forget about it.